Parked there at Polaris' media lot at the 75th Sturgis Motorcycle Rally were a couple of 2016 Empulse TTs, the electric motorcycle now being offered under the Victory brand. "You should give it a test ride!" Sash said to me. Van May, PR Manager at Victory, said "Yeah, definitely take it out." I walked to the bike, got on, while Van showed me how to work the thing. "When you turn it on, you're not going to hear anything", he explained. "Just make sure you don't crank the throttle because this thing will fly out from under you." It's strange not having to pull in the clutch lever to start and stop. Oh, this bike still has a clutch lever, but it isn't really needed. In fact, as a 5-speed manual transmission, you could start in any gear and take off just as easily. The gears are there to give you various bandwidths of speed and throttle response. They're more like different riding modes than the clutch on a combustion engine. I was only able to test ride the Victory Empulse TT around the suburbs of Sturgis mostly because the main streets were so congested that it would have taken me 30 minutes to get out on open road, and 30 minutes to get back. I didn't want to waste all that battery. But then again, an electric motorcycle with 120 to 140 miles range, and a charging time of 3.9 hours, doesn't really lend itself to an afternoon joy riding in the canyons, unless those canyons are close to your home. Ideally, this is a commuter vehicle, where a rider would take it to the office, or run some errands, and then put it on a charger. But with a sticker price of $19,999.00, it's a hefty set back for practical uses. It's release of the 2016 Empulse TT is timed with its recent success at the Isle of Man TT, where it reached the podium in the Zero Emissions category, placing third. 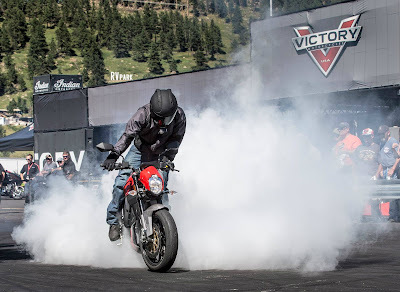 It was also timed with it's project v-twin bike, "Victory 156" built to race up Pike's Peak. Victory's new direction towards racing comes because Polaris' other motorcycle brand, Indian, has locked up the classic cruiser category. It appears that keywords like "muscle", "progressive", and "youth", describe Victory's future demographic. The Empulse TT is perhaps Victory's first factory offering in this new direction. Certainly, they did a good job making a few small touches to improve on the looks of the Empulse TT after they bought it out last year from it's original creator, Brammo, Inc. It's probably the sexiest-looking factory electric motorcycle on the market, looking similar to the Zero SR, but more naked and mean. I was actually rather impressed riding the Empulse TT. It has a lot of power. This bike could easily throw your head back if you crank the throttle, yet it's also very forgiving when twisted slowly. There's no warm-up required with the Empulse TT. No checking valve clearances, no adjusting carbs, no pulling plugs, and no air filters to clean. It's a great bike for folks who want minimal maintenance. In fact, if you're the kind of rider intimidated by heavy motorcycles with manual clutch operation, you'll fall in love with the Empulse TT. It's as easy to ride as a Vespa scooter, but with more power, more aggressive looks, and more forward-thinking coolness. As for Victory's new direction, I hope to see them redesign their v-twin engines for racing bikes, adventure bikes, and street fighters. I'd like to see them phase out their line of cruisers, baggers, and tourers, and introduce American flavors of canyon carvers, mud scramblers, and lane splitters. Where BMW, Ducati, and Honda are motorcycle icons in their native countries, perhaps Victory become the same. America is ready for a new identity in a segment other than classic cruisers.